The National Museum of Modern and Contemporary Art’s Gwacheon branch on Thursday opened an exhibition featuring Kim Chung-up, a first-generation modern architect in Korea. Commemorating the 30th anniversary of the architect’s death, “Kim Chung-up Dialogue” highlights the architectural legacy of Kim, who is widely known, though perhaps not sufficiently studied. “Though his name and some of his works are widely known, the ways in which we understood him have been quite superficial. There has not been enough research, discussions or debates regarding his legacy, particularly where the family tree of Korean architecture is concerned,” said curator Chung Dah-young. Born in 1922, Kim graduated from Yokohama Technical High School and became an assistant professor at Seoul National University College of Engineering in 1948. 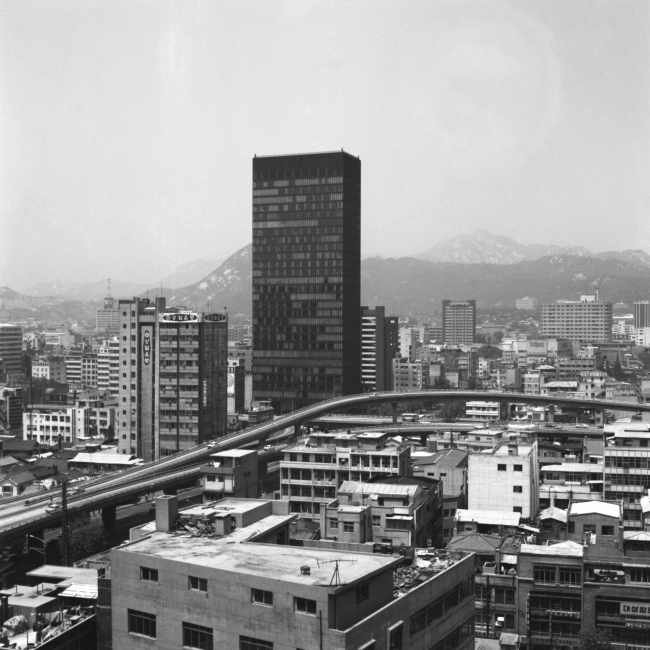 Upon the outbreak of the Korean War, he relocated to Busan, where he connected with other renowned Korean artists, such as Kim Whan-ki and Lee Jung-seop. In 1952, the architect moved to Paris, where he worked at Le Corbusier’s atelier from October 1952 to December 1955. Kim began producing notable works upon his return to Korea. His works during the 1950s and 1960s are largely marked by the architectural language he learned from the Corbusier office, as seen in the Sogang University administration building in Seoul. He built two other university buildings -- Pusan University and Konkuk University. “It was a desperate time of my wanting to get away from Le Corbusier’s influence and to stand on my own. I admit that the buildings here and there have the architectural language of Le Corbusier,” Kim once said about his work at Sogang University. Kim, who struggled to find his own architectural language, was part of the generation of artists who showed great interest in traditional culture and who tried to find new ways to incorporate tradition. Kim’s works subsequently reflected both the tradition he grew up with and the new architecture he learned from the West. “Merely collecting words left by our ancestors in the name of tradition is rather an insult to tradition. It is very difficult to invent a form based on the spirit of tradition and have new spirit to reside within. (The main gate of the UN Memorial Cemetery in Busan) is a result of my work trying to find a lost home and nostalgia from my childhood,” Kim had said. The architect’s struggle to incorporate traditional elements is best seen in his design of the top part of the French Embassy building, which took the curved eaves of hanok as a motif. The embassy building is also well-known for its outer walls that artists Youn Myeung-Ro and Kim Jong -hak made with pieces of traditional porcelain and hanok roof tiles. 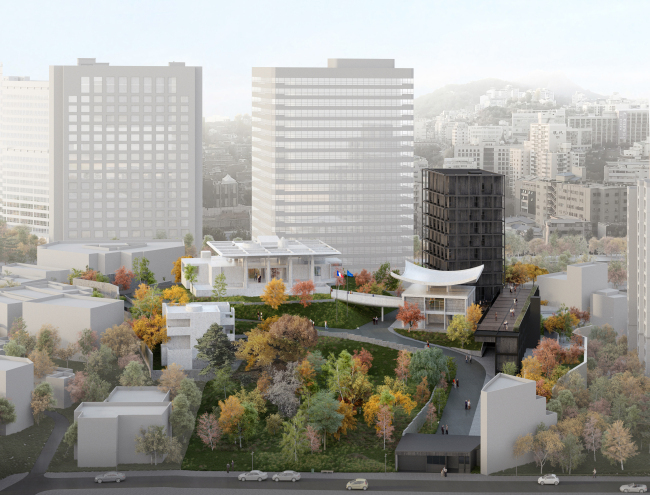 The French Embassy building in Seoul -- Kim’s best known work -- is to be renovated by French architecture firm Sathy and Korean firm Mass Studies. The main building designed by Kim will be restored, too, while a number of other structures will be added. Many other buildings by Kim, however, are in danger of disappearing. Some have already been demolished. “I hope people get to know more about the architect and appreciate the value of the works he built,” curator Chung said. The exhibition runs through Dec. 16.